What do I do if I forget or lose my password? How do I make a link in my posts? How do I change the format of the text in my post (to make it bold or italic, to add color, etc.)? Can I use a personalized signature in my posts? Am I able to search old posts? Are my posts ever censored? Can I set up my own Snitz forum? The information you provide during registration is not outsourced or used for any advertising by MaryJanesFarm Farmgirl Connection. How do I make a link (a.k.a. hyperlink) in my posts? You can easily add a hyperlink to your message. All that you need to do is type the URL (http://www.maryjanesfarm.org/snitz/), and it will automatically be converted to a URL (http://www.maryjanesfarm.org/snitz/)! 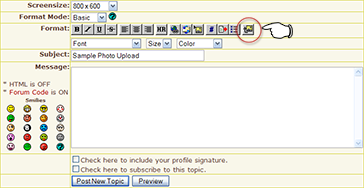 To place an image in your post, all you need to do when editing your post is find the image upload button, pictured below. If you're using the Quick Reply feature at the bottom of each topic, you can find the button next to the word "Message" in the upper left, as depicted. After clicking the button, a small window will pop up. (Pop-ups must be allowed for our site, or you must allow this pop-up.) Browse your computer for the image you wish to upload, select it, and click upload. That's it! There stands your image, all bright and shiny. Well, alright, the code will be there now anyway, and if you preview your post, you can see the images as well. NOTE: The rest of this section is for those of you who may need to (or want to) place images manually. If you copy the image link from other image hosting services, use the “Forum” or “BBCode”. Those use the standard BBCode that you'll need. However, Snitz can't read the standard code for the [URL] tag. So, if you want to use other imaging hosting websites, make sure your code looks just like either example given above. The text between the opening image tag [IMG] and the closing image tag [/IMG] should be filled in with your image's specific location and filename; and if you're linking your image to somewhere else, the link within the [URL] tag, after the =, should have quotation marks around it. If you want Snitz to actually display everything correctly, you may have to add them manually. If you don't, the URL will show up and make your post look all weird, even though your image will still show up. If there are issues with your images showing up on the forum, first edit your post to check to make sure the [IMG] code is correct. Then make sure your photos are still available on the web. There may be temporary connection issues. If everything looks all hunky-dory, please let us know and we'll see what we can see. How can I use smilies (a.k.a. emoticons)? The Children's Online Privacy Protection Act and Rule apply to individually identifiable information about a child that is collected online, such as full name, home address, e-mail address, telephone number or any other information that would allow someone to identify or contact the child. The Act and Rule also cover other types of information—for example, hobbies, interests and information collected through cookies or other types of tracking mechanisms—when they are tied to individually identifiable information. More information can be found here. The most recent version of Snitz Forums can be downloaded at forum.snitz.com.